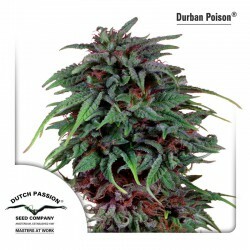 Dutch Passion lives up to its name with this reliable species: get acquainted with the cannabis seeds of Hollands Hope! The plant is ideal for the outdoor grower who is dealing with the Dutch climate because this extremely powerful indica is completely resistant to it. Being resistant to fungus, Hollands Hope rises to the occasion (regular and feminised) and when the plant is cultivated under the right circumstances, the yield can be up to 1000 grams sometimes. The flowering period takes approximately 8 weeks which means Hollands Hope by Dutch Passion can be harvested at the end of September or the beginning of October. The sower of these weed seeds can count on buds up to 50 centimetres while the total height of the plant reaches up to around 2 metres. The smoker who is looking for a lengthy period of being high/stoned will be satisfied with Hollands Hope. The THC content of 14.5 percent should not be underestimated and that is the reason why the cannabis seeds of this plant by Dutch Passion are an absolute favourite amongst its users.